From the creators of SparkNotes, something better. 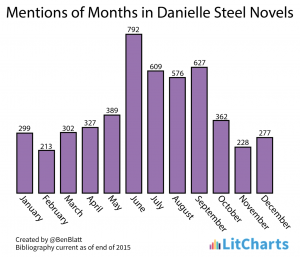 Danielle Steel has written over 140 novels and sold more than 650 million books. If you have been in a book store, or a grocery store checkout lane, you’ve seen her work. I set out to test my assumption that the world’s most prolific and successful romance author would set most of her stories in the month most closely associated with Valentine’s Day and love–February. So is February the perfect time for romance (and romance novelists)? Or do February and Valentine’s Day actually have no place in the preeminent romance writers’s heart? 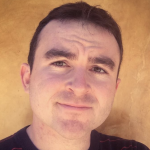 I combed through Steel’s tens of millions of published words and looked for mentions of each month. After throwing out unrelated false positives like “Freedom March,” “May I ask,” and “April’s life is about to change,” I found that not only does Steel prefer the warmer months, but February is the least mentioned month of them all. There is no love for February. While the graph doesn’t line up perfectly with a temperature plot of the year, it’s safe to say Steel prefers writing stories where the weather and the romance are both steamy. While June-September come in strong, November-February lag significantly. And even excluding the month, frequent invocations of Valentine’s Day are surprisingly absent in Steel’s work. Christmas, Thanksgiving, Easter, New Year’s, and Fourth of July all have more mentions than the day specifically designed for love. Only six times as many mentions of Valentine’s Day as of Yom Kippur. Really. If the data above are not enough to get you out of your single shame, keep in mind that Valentine’s Day this year falls on a Wednesday. 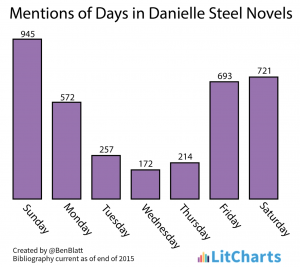 Unsurprisingly, most of Steel’s romances are concentrated on the weekends, with Wednesday being the least active day. It’s bad news for this year, as Valentine’s Day 2018 falls on Wednesday, February 14th. Steel’s novels are known for more complex relationships than an old-school Harlequin romance, but still usually deliver something close to a traditional romance happy ending. Her stories are designed to resonate with readers. Is it simply because of the weather? Probably not, but in the same sample of books she brings up “summer” four times as often as “winter”. If you are worried about not having a fairy tale romance by this year’s Wednesday Valentine’s Day I wouldn’t worry. After all, June is just four months away. Ben Blatt is the author of Nabokov’s Favorite Word Is Mauve. Scratch and Sniff: Which Novelists Have the Smelliest Books? Does Trump Really Have the Best Words? LitCharts is the world's best literary resource, with hundreds of literature guides, literary terms, and modern English translations of every Shakespeare play. Millions of students and teachers read LitCharts every month. Subscribe to get instant access to everything we offer!